Weirich Welding Plus constructs any size livestock gate with essential durability. Our gates are made from 1.9″ gauge round tubing custom-made to any length – heavy enough to handle heavy cattle pressure. Our load-out chutes are made with a combination of pipe and concrete oilfield pipe posts are set in the ground with an 8″ pan welded to the post and then rebar reinforcement welded in. They are poured with 4,000 lbs. of concrete with deep grooves troweled at the top and a swivel bunker welded to the front. Weirich Welding Plus constructs pipe fencing out of used oil field pipe and sucker rod. The posts we weld are set 8 feet apart in concrete. We also do fabrication of many products, including gates, hinges and latches. 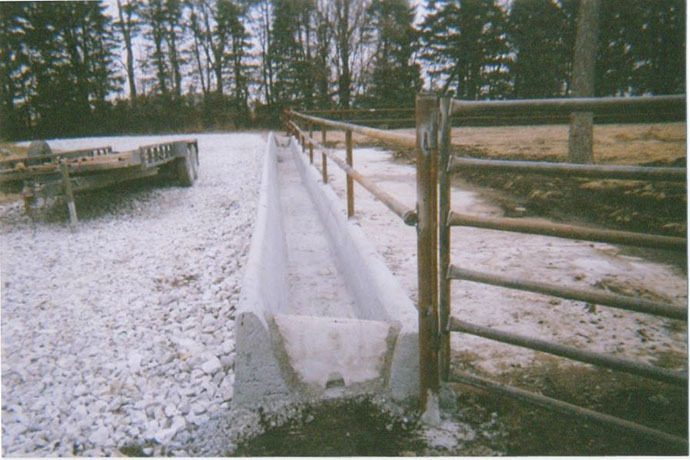 Our slip-formed concrete feed bunks are poured on-site and range anywhere in length. Our slip-form method allows for easy cleaning. Extremely sturdy. In addition to our concrete bunks, we pour feeding apron water or pads, as well as any other necessary concrete. Constructed out of a combination of used oil field pipe, sucker rod, sheet steel, and concrete. We offer two different types of loading chutes The first style is made from 100% concrete and is very durable. The second style has a concrete base with steel sides and is less expensive. 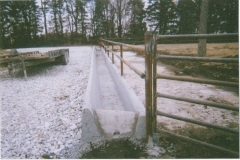 Miscellaneous concrete work usually associated with feed lot construction. Concrete pads for grain bins.